Sony's real-name identification system will be ready on November 15th. Last week, Microsoft announced that it was planning to postpone the release of its real-name Gamertag system-a feature that the company has been teasing since the Xbox One announcement in May. Microsoft didn't cancel development, but if you were looking forward to the feature, you'll have to be patient. PlayStation 4 owners, on the other hand, should be able to use their real names when the PS4 hits the market on November 15th. 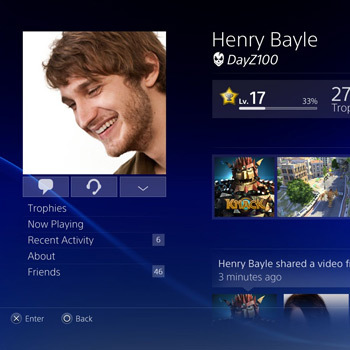 "[With the] PlayStation 4 we are transitioning to a friends network based on real world friends. We'll keep around the alias and icon used in today's multiplayer matches. These are great to have when anonymity is important. But most of the new social dimension to PS4 will be interacting with friends using real names and profile pictures most likely seeded from your existing social network." As much as I would love to believe that real-name user IDs will change the way that gamers interact, Xbox LIVE and the PlayStation Network will probably never be safe for anyone with low self esteem.